Before sending any email or SMS campaign, you need to create a group. There are 4 methods to do this. 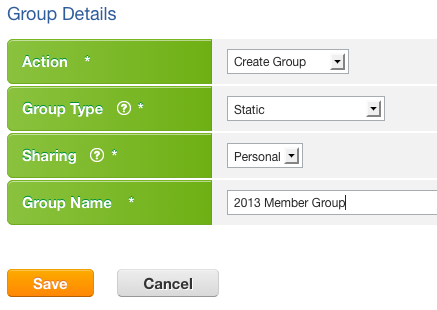 When you import contacts, select [Create Group] under [Action] of [Group Creation] settings. 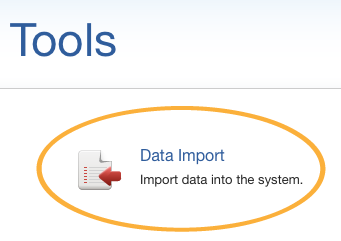 To view the details, please check the article: Import Contacts - Create Group. Click [Tools] at the top right corner of the screen. 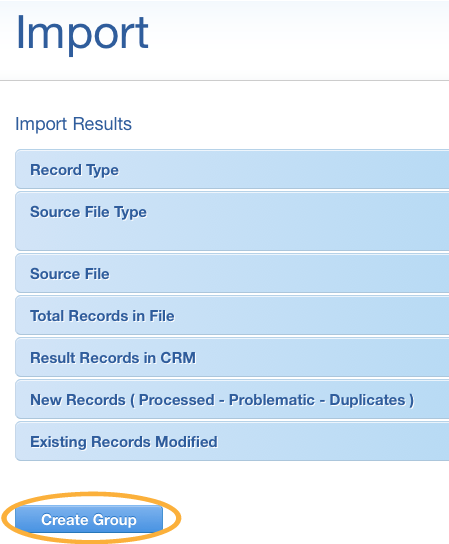 Click [Import ID] to see particular import report. Under [Import Results], click [Create Group] button to save successfully imported contacts into a group. Enter the [Contact] section. 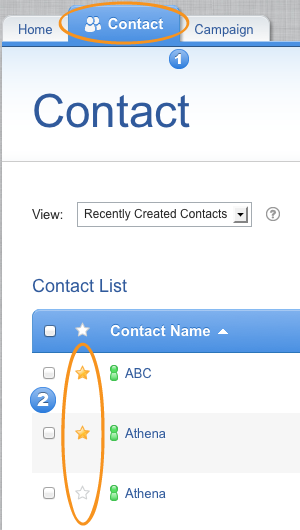 Click the [Star] icon next to the contacts which you want to add to a group. View [Tagging Basket] by clicking its icon in the top bar. On the bottom of Tagged Items, you can see buttons for bulk actions. 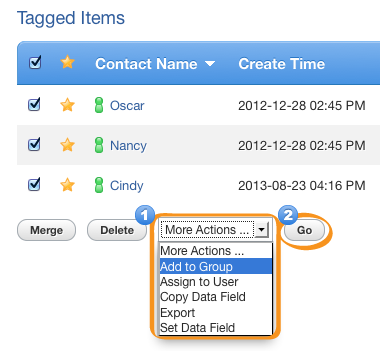 From drop down list [More Actions], select [Add to Group], then click the [Go] button next to it. Sharing: Decide whether to share your group. Keep [Personal] if you do not want to share to other users. Group Name: Give a name to the group. Group: If you have chosen [Append to Group] or [Overwrite Group] in [Action], then you have to select a group only correspondingly, else you will not be asked for this option. Click the [Save] button after filling in the form. Enter the [Campaign] section, then click [Group] at the top right corner. Click [Create Group] at the top right corner. Define criteria for contact searching. You can add more criteria by clicking the [Add] icon. Click the [Next] button after defining all your criteria. 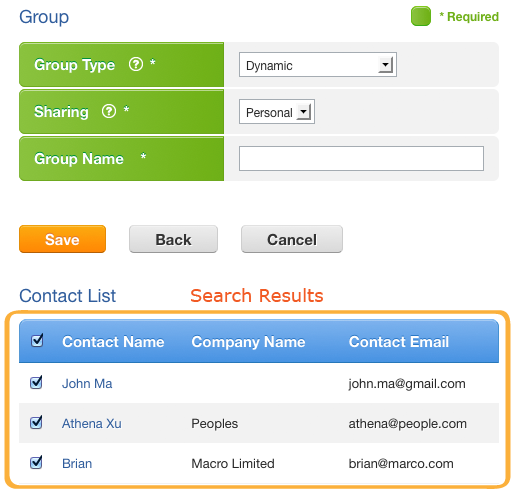 To save matched contacts into a group, pick a group type, define its sharing status and name it. 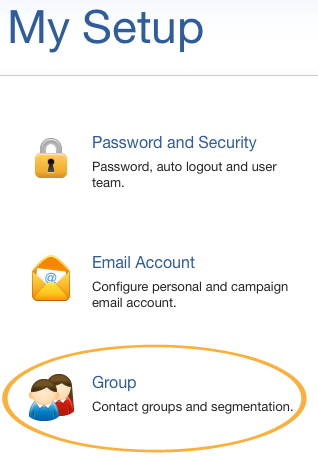 If you uncheck any searched contacts, you will not be allowed to save the group as [Dynamic Group]. Click the [Save] button to proceed.